Jonathan Steinberg has written a gripping account of the life of the Iron Chancellor, a complex and contradictory figure who unified Germany and transformed Europe through the sheer force of his personality and his ability to manipulate Emperor Wilhelm I. The master of Realpolitik was a pugnacious pragmatist, a hypochondriac and much else besides. 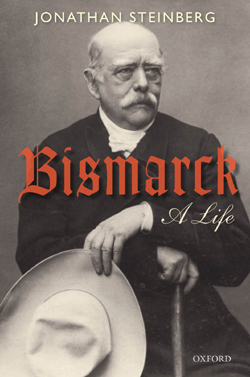 Bismarck was one of the most influential and remarkable statesmen of the nineteenth century. A political genius who managed the seemingly impossible task of unifying Germany without a political party to support him, despite a hostile parliament and with no direct control over an army. His only weapons were the sheer force of his personality and his canny ability to manipulate Emperor Wilhelm I.
Jonathan Steinberg’s biography takes a new look at this witty, slightly hysterical despot using the diaries and letters of his friends, colleagues and enemies and he paints a portrait of a man full of contradictions. He had grand political visions that were created with subtle strategies of political genius but his pettiness and vindictiveness were never far behind. Bismarck loved conflict and he had a taste for being offensive. His “slap in the face” approach to political manoeuvring was a tactic in itself which led him more often that not to get his own way. To the modern mind, Bismarck is a dyed in the wool reactionary, a mix of Churchill and Pinochet. He was anything but consistent though. His conception of Realpolitik meant that anything that allowed him to get his own way was acceptable: whether or not that meant joining an Evangelical Christian sect as he did as a young man giving him a start in politics or cosying up to the Liberal party when it served his purpose. He even went so far as turn the Prussian political landscape upside-down by adopting full male suffrage much to the chagrin of his fellow conservatives. 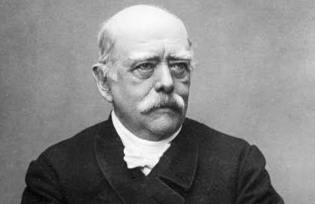 The Austrian Foreign Minister Baron Rechberg summed up Bismarck’s protean nature, when he said that he could not trust Bismarck as he was “capable of taking off his jacket and climbing on the barricades.”. This is no hagiography, Steinberg is a highly critical of Bismarck who he depicts as a neurotic, unprincipled, mendacious and pusillanimous man. It is odd to read a biography where the biographer does not have full sympathy with his subject. At times, you can imagine that Steinberg almost dislikes the man but his respect and awe for his tremendous capabilities stops him from dismissing Bismarck as an inhuman and somewhat superficial monster. Steinberg runs a steady course and does not let his feelings run away with him. At times you do feel that the tag of “genius” is used a little too often and it sits ill on a man who for 500 pages is described as something of a mediocrity on a human level. Steinberg balances out Bismarck’s human failings with his evidently gargantuan political abilities. Steinberg walks us thorough Bismarck’s life. As a child he was torn between an ineffectual father and a cold mother which Steinberg feels may be a psychological scenario that Bismarck repeatedly played out in his relationship with the Emperor and the Empress. It does seem clear that Bismarck was something of a son for Emperor Wilhelm which might explain why he was so easily manipulated by him. His early life is uneventful, he was a restless student and an unhappy and bored civil servant in his early working life, so much so that he threw it all in and went off to manage his family estate. Even in the countryside he as a live wire, he was given the nickname of “Mad Junker” by his fellow country squires. He had some early interest in women and appeared to fall in love but eventually settled for a very lacklustre marriage to the extremely religious and dowdy Johanna von Puttkamer (on the rebound). For those that can tell the nature of the man by the woman he marries, this liaison would be something of an Achilles heel. It was not until 1847 that Bismarck entered politics and his aggressive approach towards the liberals and those that supported the 1848 revolution made him a natural leader amongst conservatives despite his inability to give thundering rhetorical speeches. He also had a spell as a diplomat, as the Prussian ambassador to Russia which he appeared to enjoy. Then fortune turned in his favour and as if by magic he was catapulted centre stage. Bismarck was nominated Minister-President of Prussia in 1862. The political environment was turbulent. King Wilhelm I, was even contemplating abdication, but in a fortuitous gamble he decided to try his luck and appointed Bismarck who was by then already 47 years old. He soon made a name for himself as a full-blooded reactionary with the liberals and an unprincipled and virtually immoral politician by the old time traditionalists of the his Junker class. He became equally loved and despised but widely respected. Bismarck stayed in power 1862 to 1890 and transformed Prussia, Germany and Europe. King Wilhem I had gambled on Bismarck and won. At his death, King Wilhelm I was no not merely the King of Prussia but the Emperor of Germany and the strongest power in Europe. Bismarck seemed to have luck on his side, but he also made his own luck, through hard work and determination. He spent his life fighting liberalism and found natural allies in Russia and Austria, with their authoritarian and anti-democratic traditions but he was fighting a losing battle. The reactionary absolutism that he championed had had its day by the time he left the political stage. The great man acted as a bulwark against liberal and democratic principles while he could but when Bismarck was brushed aside, those principles flooded the political arena. So where did Bismarck’s genius lie exactly? He was the father of “Realpolitik” which meant “constantly shuffling sets of alternatives and playing off one against the other.” His real genius lay in his guile, cunning and sense of political timing – but above all in his willingness to take risks and be shockingly aggressive. Never has the force of personality alone achieved so much.